In 1886 Charles Newning bought the northern portion of the Swisher farm and developed an addition he called Fairview Park. In contrast to Swisher’s grid-style addition on the high, relatively flat ground of the area, Fairview Park was created over a hilly area with two creeks through it and numerous city views from its hillsides and terraces. Newning intended to sell his large, irregular-sized lots for grand homes in an attractive, arboreous setting. The Austin Daily Statesman helped Newning’s efforts by calling South Austin a premiere residential setting. South Austin has neither railroads, factories, board of trade, or large hotels, but she has health, bracing air, fine roads, sewers, indescribable scenery, many modern residences, and a baseball club. When the north side of the river is lined with factories, and the dense smoke of soft coal is resting like a pall over the city, then the South Side will become the main residence place. Mark the prediction (Austin Daily Statesman, December 11, 1887). The newspaper’s glowing recommendation notwithstanding, Newning’s efforts were only modestly successful in the years before the streetcar and the automobile. When Charles Newning, the agent for a New York bank, came to town in 1878, he saw the need for an upscale, owner-occupied “garden suburb,” of the type then trendy in the East, where those same families would actually live, and bought 200 acres northeast of the Swisher Addition for Fairview Park. Today, Fairview Park is the “rambling” part of Travis Heights – indeed, one of the streets was called “The Ramble” (it’s now Park Lane), along with The Circle, which in Newning’s plan was actually a circle. Newning envisioned large houses on large lots, installed the utility infrastructure himself, and divided his tract into irregular portions to accentuate each homesite’s “picturesque” natural elements. This is all standard today, but at the time most subdivisions relied on standard grids with regular lots, left sidewalks and sewer hookups to the owners, and made no attempt at income segregation. For example, the Doughty Addition, a three-block development platted in 1890 east of Congress and south of the Swisher Addition, advertised thus: “Homes for the laboring men! No city taxes! Homes for the young couples! No city taxes! Elegant suburban places for active and retired business men! No city taxes!” (Two of the larger lots, intended for those business men, would later become Cinema West.) Still, by the time most of the lots were sold, the city taxes had arrived. Ultimately, Newning took a bath on Fairview Park, partly because the Austin gentry preferred neighborhoods that didn’t require a river crossing – by 1900, the Congress Avenue bridge had become the state’s most notorious traffic bottleneck, and would remain so until the erection of the Montopolis (1938) and Lamar (1941) bridges. That traffic was a boon to businesses along South Congress, which was in turn good for less pretentious neighborhoods like the Swisher Addition. But Newning’s ambitions for an elegant enclave were doomed by the growth of the adjacent South Congress strip; it wouldn’t be until the 1940s that Fairview Park, by that point substantially altered and downscaled, would be completely built out. Of course, the Stacys’ vision of suburban splendor would have gone nowhere were the “downtown attractions” not right across the river, easily accessible by foot, car, or streetcar, and clearly visible from the Heights. And while Travis Heights was quite the hit, it didn’t lead to a wholesale boom along the South Shore. West of Congress remained a largely rural preserve until WWII, even though subdivisions like the Bouldin Addition (which, like Travis Heights, was only one segment of the neighborhood that bears the name today) were platted before WWI. Once you got as far west as the Fredericksburg Road (today’s South Lamar Boulevard), the subdivisions themselves disappeared – except for Barton Heights, core of today’s Zilker neighborhood. Since Austin’s earliest days, a ferry had served South Austin from the foot of Congress Avenue. In the 1870s, a wooden pontoon bridge, which washed away with each flood, spanned the river to serve the few residents living in South Austin. 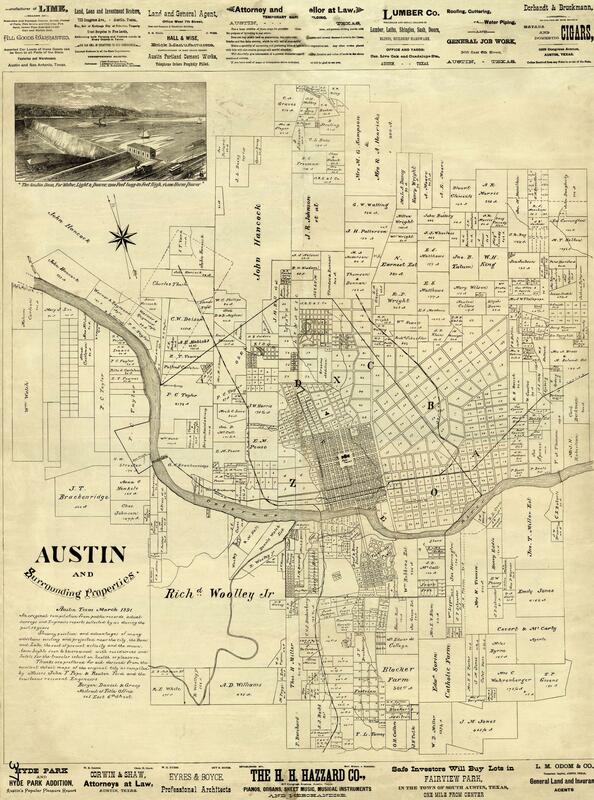 Realizing that more reliable access to South Austin would be established shortly, Newning formed a partnership in 1880 with William H. Stacy and George Warner and purchased 200 acres on the south bank of the river east of South Congress Avenue to Fowber’s Creek (now called Blunn Creek). Subsequently, a stone toll bridge was opened across the river in 1883, and in 1886 a parade down Congress Avenue marked the opening of the first permanent free bridge to serve South Austin. Newning took the lead in the partnership and named the new subdivision Fairview Park because it had a “fair view” of the city from the bluffs. He emphasized from the first that Fairview Park should be a model residential development with graded, curving streets, utilities and extensive landscaping. Fairview Park was laid out with large lots that took advantage of the natural contours of the land to provide many dramatic home sites. By 1891, a number of fine houses had been built in Fairview Park, including the Academy (402 Academy), the Dumble-Boatwright House (1419 Newning) and the Red-Purcell House (210 Academy). Mr. Newning’s ideal development was never realized in large part because he did not anticipate the extent to which commercial development would occur on South Congress, the difficulty of crossing the river and the distance from town. Before the turn of the century a number of Victorian homes were built on the large lots. Development, however, was so sparse that starting in the 1910’s lots were subdivided into smaller parcels. In the 20’s and 30’s, small bungalows and cottages were built on these smaller lots. A much altered and downscaled Fairview Park was not built out until the 1940s.